Come and Get Your Wings! It’s time for Football at Finney’s! Come and get your wings! Football wings and Octoberfest beer… I love this time of year! It’s that wonderful time of year again. The heat of Summer is cooling down, the leaves are starting to change color…. but more importantly, ITS TIME FOR SPORTSBALL! 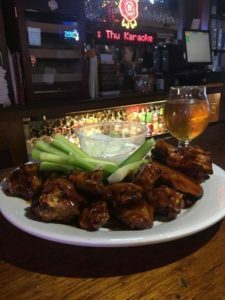 Whether you take em to go, or stop by and grab a beer, nothing goes together quite as well as Beer, Football, and Wings. You can get them in any quantity from 10-150. It really just comes down to how hungry you are. We now have over 35 wing sauces, and our beer selection is always changing… However, its the perfect time to enjoy one of our Pumpkin or Octoberfest beers on tap or to go! Check out our wings here!